I've got another My Creative Time sneak peek for you today! This one is a really fun new stamp/die set that a lot of you have been waiting for: it includes feather dies! Believe in Your Dreams includes three feather dies with coordinating stamps. I inked mine up with some Tim Holtz distress inks, and I love how colorful they turned out! I mounted them onto a tag made with the Tag Die Layers using some dimensional adhesive and tied them together with a little green hemp. The set also includes 3 little heart dies with coordinating stamps. I used the medium sized one on my card. The "thanks" sentiment is from this set too. Don't you love the font? So pretty! Katie this CAS style card is just perfect. I love the gorgeous colors of the feathers and how gorgeous they blend together so nicely. TFS! Beautiful blend of colors! Looks so pretty! These feathers are so pretty and colorful!! Love how it turned out. Thanks for sharing! Your feathers turned out so beautiful yes I love how your TH Distress ink pads worked...YEA I have some. That "Thanks" is so cute and yes I really love the font it's so sweet. love the awesome creative ways you've used Miss Emma's goodies....So can't wait to get these Feathers and stamps. YOU ROCK!! Love those brightly colored feathers! So pretty!! wow beautiful focal point= the feathers!!! there are so beautiful! What a sweet Thank you card! I Love how you did the coloring on the new feather dies!!! Fabu! The rainbow feathers are beautiful. Very cheerful card. oh your rainbow feathers are so awesome! thanks for the great card you are show casing here! So pretty!! I love this card! CAS and GORGEOUS Katie! LOVE those beautiful colored feathers!!! Feather fabulous, especially in the colourful distress ink combinations you've chose! I think this will be a 'reach for often' set! Trendy, pretty and ever so versatile. Your card: stunning! Just Fabulous! I love all the colors of your feathers. They are superb! Thank you for sharing. Just gorgeous, Katie! Lovin' the combo of TH distress inks you used. 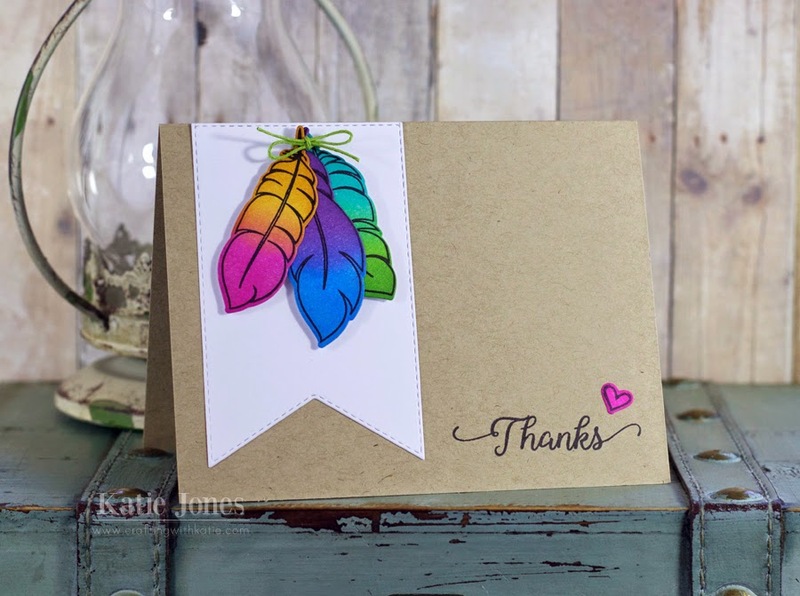 Love the pop of bright color the feathers add to the card! I absolutely love those brightly colored feathers and your CAS design. Gorgeous card! A wonderful card! Awesome job! Love the shading on the feathers. clean and simple card and so pretty. I loVE your yummy feather colors. Thanks for sharing. Katie ~ oh my your feathers turned out so PERFECT!! LOVE how used bold colors and then inked them ~ EEK! Then on the white space with the Kraft card stock ~ BEAUTIFULLY done! What a fun card, love the bright colors. Yes, I do like the font on the "thanks" stamp. Great card Katie. The feathers turned out so nice with the bright colors. Love the font. Perfect use of the tag to showcase those darling feathers. Super cute and colourful...love those feathers! Your watercoloring is awesome Katie, so colorful! Great card design also! I do love that font! So pretty! I love the colors of your feathers...So bright and vibrant. Beautiful job on one beautiful card. Love the coloring of the feathers with the tan color cardstock an don't forget the cool heart that draws your eye!!! More rainbow feathers?!? You and brigit are killing me!! Love it! Nice ombre and blending effect! I don't think you can go wrong with those feathers! I always love the look of ombre and you've done it so well! Love your card! Those feathers came out beautiful, love it with the kraft!